When the news broke about the One World twist for this season of Survivor, it seemed to promise a lot more unpredictability to the formula. The previous two seasons had many expected boots after the merge. This crazy installment has included more goofy play, so it's been a surprise that we've again received predictable exits. Players threaten to flip on their fellow alliance members, but they eventually settle for the easiest vote. This pattern makes sense for the dominant contestants, yet it feels short-sighted for the others. This week, Troyzan tries to change the script, but his fate is sealed once he loses the immunity challenge. The only guy remaining is Tarzan, who may last a while but has little chance to win. The previews for next week again show dissent in the dominant alliance, but I'll believe it when I see it. Christina seems destined to go home unless something crazy happens. For more details, check out my post about this latest episode for Sound on Sight. Never one to resist the chance to provide some unintentional humor, Jeff Probst fails to disappoint this week by noting that the women are getting "lubed up" before the immunity challenge. He can't help himself! I thought players weren't allowed to kill animals like pigs ever since Mike Skupin's action in Australia drew heat. Maybe that's why everyone was so inept. Until this week, Tarzan has voted with the women, yet he keeps talking about how the men are in trouble. He's part of Kim's alliance! I guess we'll find the definitive answer next time. If anyone's going to prevent Kim from rolling to the end, something has to change soon. 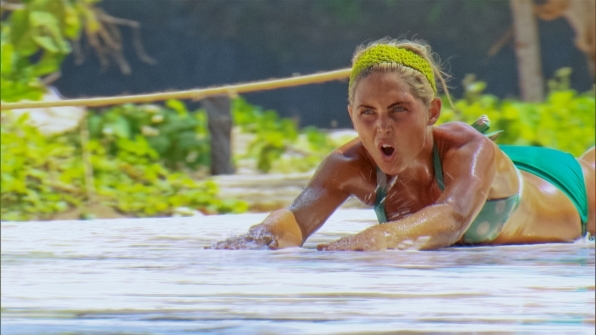 If Christina or Tarzan leaves, the numbers will make it tougher to stop her.